Zoe and Zelda have been telling me for a while that fear of swine flu is the reason that their school has not been visiting the soccer and hockey fields for sport days this winter. At first, I didn’t believe the girls. I mean, hasn’t it been proven that going outside in winter doesn’t make children sick? And hasn’t it been proven that keeping tons of snotty-nosed kids cooped up together does make them sick? I thought perhaps it was a language misunderstanding…but now I’m suspecting the Zs may be right! 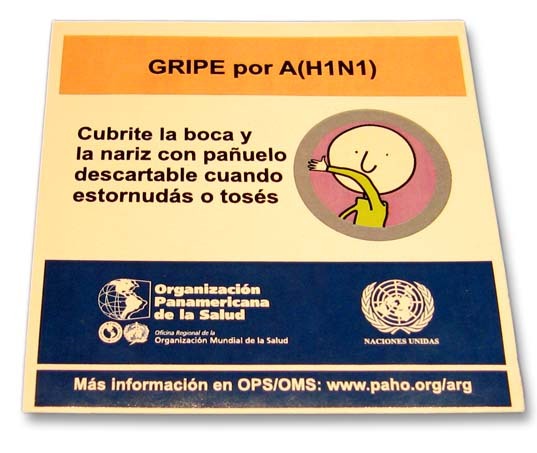 Yesterday, they brought home a sticker, pictured above, that is supposed to inform them about how to prevent the spread of swine flu. The notice advises young people to use a disposable tissue over their nose and mouth whenever they sneeze or cough. Advertising 101: pictures should match the message! This entry was posted on Wednesday, June 24th, 2009 at 5:10 pm. You can follow any responses to this entry through the RSS 2.0 feed. You can leave a response, or trackback from your own site.